Jazz trio or quartet performing jazz standards. Can perform acoustically, enabling musicians to stroll around or play at tables. Jambalaya offers you a tailor-made band for your function or event. Choose the right size and style of band from Jambalaya’s team of top UK professional musicians. We will advise you on everything from musical content to the right group, large or small, to suit you and your budget and to ensure your event goes with a swing. Join in and dance with the Creole sounds of a quartet or singalong with a razzamatazz trio. Catch the flavour of New Orleans: Mardi Gras! Street Parades! Festival time! Jambalaya’s marching band is perfect for carnivals, outdoor functions, processions or stage presentations. Seasoned with star musicians who have played in New Orleans itself, the band brings the thrilling sound of Mardi Gras to any event. We can provide a full presentation with Grand Marshall, dancers and umbrella-waving ‘second line’, or a smaller band for the more intimate function. Our swinging sounds and musical stars have enlivened steam rallies, store openings, conferences, international festivals. 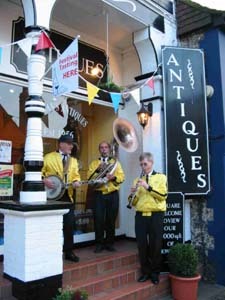 Dixieland takes to the streets! Our small group, drawn from the brass band, is designed to be mobile. Our wandering minstrels have brought a touch of excitement to shopping malls, restaurants, theme parks and events like the Soho International Jazz Festival. The keynote is mobility. No sound systems, no stage sets: we make our music where you want it! Our eyecatching uniforms will bring colour and class to your event. Playing the classic hits of jazz greats like Kid Ory and Jelly Roll Morton, our New Orleans band recreates the golden age of jazz. We play for dancing, for concerts or we can provide a complete evening’s entertainment with our ‘band-within-a-band’: the Jambalaya trio. Soft mood music from the piano or the trio as your guests arrive – light entertainment for your diners – hot dance music to finish the evening with everyone clamouring for more! We provide a full entertainment package for weddings, conventions, theatres and we have packed venues from London’s 100 Club, the home of traditional jazz, to the Institute of Chartered Accountants in the City of London! Many of Jambalaya’s top professionals are drawn from the internationally famous London Ragtime Orchestra. This band needs no introduction – its spectacularly successful career has taken it to top international festivals, many of Europe’s great theatres, appearances on BBC TV, 3 albums, and regular sell-out appearances at London’s Barbican and South Bank concert halls. Why not book the LRO for your prestige event, and recapture the swinging sounds of Scott Joplin? Grosvenor Theatrical Productions (Trusthouse Forte), B & Q DIY Superstores, Old Orleans Restaurants, Norman Meadmore Concerts Ltd and many, many more.